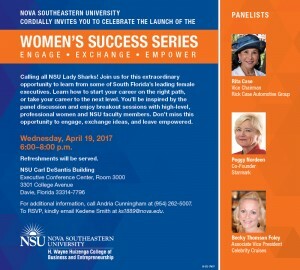 FORT LAUDERDALE/DAVIE, Fla. – NSU’s H. Wayne Huizenga College of Business and Entrepreneurship (HCBE) at Nova Southeastern University (NSU) is launching its first Women’s Success Series (WSS) on Wednesday evening, April 19. The goal of the initiative is to give female business students the necessary skills to succeed in today’s marketplace. NSU’s Huizenga Business College is comprised of 70 percent female students. The launch event, intended to gain awareness of the actual Series, which anticipates starting in winter 2017, will be held on NSU’s Ft. Lauderdale/Davie campus in the HCBE’s Carl DeSantis Building, executive conference room 3000. It will include a panel discussion and breakout sessions with high-level, professional women and NSU faculty members. Panelists include Rita Case, vice chairman, Rick Case Automotive Group; Peggy Nordeen, co-founder, Starmark; and Becky Thomson Foley, associate vice present of Celebrity Cruises. This actual program will be introduced in winter 2017, when students will be invited to participate in “Women’s Success Series” and its eight-week series (spread out over 16 weeks) of non-credit classes led by NSU faculty with guest appearances by WSS members who are community business leaders. Classes will cover such topics as salary negotiations, communications skills, accounting and finance, entrepreneurship and management/human resources. Once the students complete the classes, they will have the opportunity to do a C-Suite Shadow day with WSS Founders. In addition, a goal of the series is to help students develop a strong mentor network. The event, which begins at 6 p.m., is for NSU HCBE students only. Students can RSVP to Kedene Smith at ks1889@nova.edu. Information can be obtained by contacting Andria Cunningham at 954-262-5007.